This gallery will be dedicated to display children’s work on social issues. The work will include paintings, sculptures, installations and other material developed by children in schools within Pakistan as well as overseas. 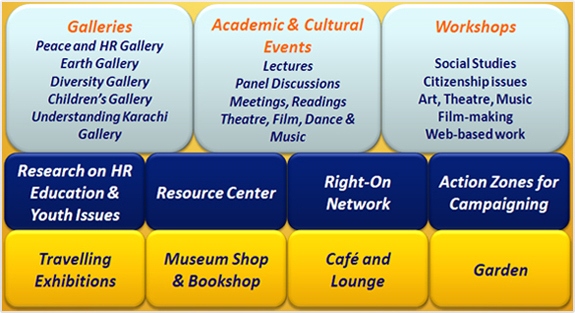 This gallery will be specific to Karachi and will aim to help children understand how Karachi functions. It will cover the history of Karachi, the social sector profiles of the city, how it is organised and run, the problems it faces and how they can be solved. This gallery will cover the histories of peace movements and people’s movements around the world, profiles of key peacemakers and organisations, important milestones relating to peace and human rights, and key concepts around rights, responsibilities and citizenship. This gallery will explore and celebrate the diversity of religions, cultures, languages, customs and traditions, clothes, food, etc. within Pakistan and internationally. Through celebrating diversity, the gallery will promote acceptance, tolerance and peaceful co-existence. This gallery will aim to educate children about the natural world they live in. Issues such as global warming and climate change will be focused upon and how these problems are all part of the larger problem of social injustice. Workshops: Interactive workshops for children and teachers will be held, covering a wide spectrum of social issues through sessions involving art, theatre, film-making etc. Professional groups and individuals will be hired to run these workshops. Academic, cultural, social and professional events: A variety of social and cultural activities will take place at the CMPHR. For example, guest speakers (local and international) will be invited to give lectures and hold discussion sessions. Panel discussions on various themes, involving children as panellists, moderators and audience, will be organised. Book launchings and readings will take place, as will cultural events involving theatre, music and dance. Resource Centre: The CMPHR has built up a Resource Centre with a collection of over 4,000 units including books, teachers’ manuals, videos and multi-media material on a broad range of social issues. Much of the material is in the shape of teacher’s manuals and material aimed at teachers and students. Once the museum is opened, this will be expanded. Special, thematic exhibitions of books will be put up. The possibility of a travelling library on specific, topical themes, to schools will be explored. Action Zones for Campaigning Activities: The tradition of running structured campaigns at HREP will continue at the CMPHR, since these are very popular with children and teachers. In addition to the ongoing campaign, each gallery will also contain an ‘Action Zone’, where visitors will be able to take action. For example, in the Nuclear Gallery visitors will be able to make origami paper cranes which will be temporarily added to an installation on display and will later be sent to Japan as part of the Sedako campaign. Another example would be the Peace and Human Rights Gallery where visitors will be able to sign petitions, write letters or e-mails on topical issues to the concerned authorities. Forum for Right-On Network: The CMPHR will provide a space for Right-On Network members to attend meetings and activities, and to develop a sense of belonging and ownership of the Network. Travelling Exhibitions: Temporary exhibitions will be converted to travelling exhibitions to tour schools and other relevant institutions. Research Work: A Research & Development unit will be set up to undertake structured research on social, educational and youth issues. Museum Shop & Bookshop: Like all museums, the CMPHR will house a shop, which will, amongst other products, specialise in books on social issues. Lounge and Café: The lounge and café area will provide a safe space where children will be able to rest and have their packed meals or snacks offered by the café, and meet children from other schools. Garden: The facilities for the CMPHR will include a garden area for families to relax and rest before or after visiting the CMPHR.